Life's what you make of it Amigos!!!! Those who religiously follow the sport of cricket would be aware that India made history recently when it won the Test Series against Australia in Australia. This is the first time in 70 years that India has won a series in Australia. They won the series conclusively with a margin of 2-1 in a series of 4 games with 1 game being drawn. This marks the ascendancy of India as a cricketing superpower. Gone are the days where the team was mocked as paper tigers who could win only at home. Now with wins in England, South Africa and now Australia it can be safely said that the team are now global tigers. This win is important for the team with the ODI World Cup on the anvil in England in the May of 2019. Welcome to 2019, I wish you all the very best for your hopes, aspirations, and your goals for the new year. Everyone of us has plans, goals and ambitions for the new year and I am no different. My goal for the new year is to lose weight and to be fitter by adopting a healthy lifestyle. Now I don't know how successful I will be in my goal, but I believe that I will give it my best shot. As they say customarily, ring out the old and ring in the new. So bye 2018, you were good to me and I had a great time last year, it was perfect in the sense that there were ups 👍and downs 👎 in the year, more ups than downs and that's what made it worthwhile. Welcome 2019!!! ✌✌ I hope you will be as good as 2018 if not better. I wish all of you a great 2019 one which is better than your 2018!! If you are looking for some inspiration then I will leave you with the thought, get out of your comfort zone, that will help challenge you to greater heights, but as always take care to help and comfort your fellow humans. K.G.F: Chapter 1 (2018) is a new benchmark in Kannada cinema. It is one of the first movies from Sandalwood to break the pan-India regional barrier and run to full houses and acclaim all over India. I call this the Baahubali effect. SS Rajamouli broke the mindset that you need to know the language to enjoy a movie. With Baahubali getting global acceptance, people woke up to the fact that there are good stories being told in non-Hindi cinema as well and they are well worth the price of the admission ticket. KGF is a throwback to the days of Zanzeer, Kaalicharan, Agneepath, and Sholay. The movie has a good script and the casting, especially for the protagonist and the antagonist, is well done. The editing could have been a bit crisper, Indian movies still have to get out of the romance and song mindset. But overall the cinematography and the visual stylization of the movie is pitch perfect, even though I am non-Kannadiga, I watched this movie in the theaters and enjoyed every bit of it. IMHO the director has enough material to split the movie into 3 parts, rather than the chapter 1 & 2 that is proposed, but Indian movies are not yet acclimatized to trilogies yet, it is hard to hold the audience interest for the time taken to produce and direct 3 parts. Director Sriram Raghavan nails the movie. The story, narration, editing, music, casting, and execution is pitch perfect. The movie shows that it is possible to make enjoyable, riveting cinema without hyped up action scenes, item songs, and frivolous romance. 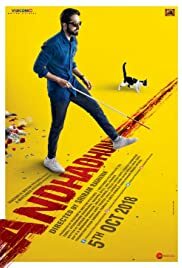 Andhadhun is watching a masterclass on how suspense thrillers work. A movie does not need a big star to work, all it needs is a good solid script, and actors who believe in it. Ayushmann Khurana is spot on as the blind man who gets caught in a situation which is as unanticipated as it was. Tabu shows us what Bollywood is missing out on with a power-packed performance. The music and songs in the movie are spot on and are essential to convey the voice of the movie. To say anything more would spoil for the movie for those who haven't seen it. My only suggestion: Watch the movie. 2019 is heavily anticipated with a lot of books and movies coming out. Avengers: Endgame (2019) - The conclusion to the cinematic universe spawned off Marvel. Whatever comes after this will be a new era. Glass (2019) - M. Night Shyamalan’s superhero trilogy concludes with Glass. Kolaiyuthir Kaalam (2019) - Nayanthara has gone from strength to strength this year (2018) with Immaikal Nadodigal and Kolammavu Kokila. This will be another one to watch.